Let their imaginations run wild on the MINI Movie Stage. 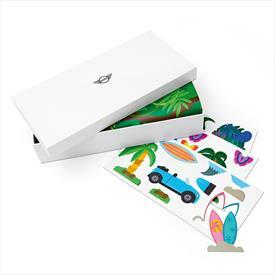 It contains seven sheets with a variety of playful pre-cut props and four different backdrops, as well as a foldable mobile phone stand for easy recording. All the fun is neatly packed into a handy slip lid box.